Quite a while ago, I saw a very interesting post on 101 Cookbooks about a Salad Booster. As I normally do with interesting recipes I printed it out and filed it for future reference… but once I made it, OMG, it was amazing! Not only did it add a fabulous flavour to salads. Why when typing Fabulous do I get the urge to not only type in CAPS, but to also mouth FABULOUS in the style that Hugo Weaving did in Priscilla Queen of the Desert? btw, FAB film (notice I avoided the FABULOUS there!).. watch it.. I love it – a real buddie movie with a lot of feel good factor. One of my favourites! 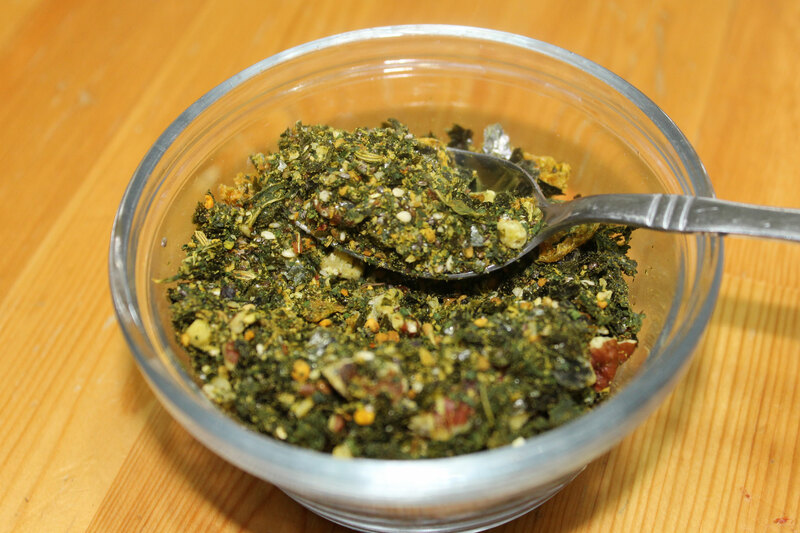 Anyway that is enough about movies, back to the seasoning mix and salad booster…. This is seriously great stuff! I modified it a lot, but I do use it for everything from adding extra flavour to salads, more seasonings and nutrition to eggs for breakfast (just stir it into your scrambled eggs or sprinkle over the poached or fried eggs, try it, you will love it!), . 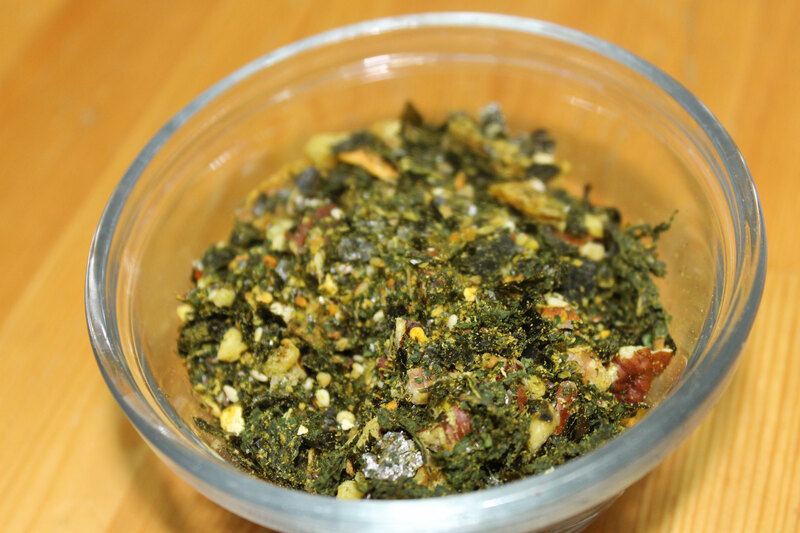 I throw it in to omelets and I have even included it into breading for fish, chicken and pork… in the latter case I just added it to the breading mix, much as you would add other seasonings. and C also discovered that adding this to popcorn with butter and coconut oil makes it taste fabulous (hey we are back to Hugo Weaving again! Hubby is going to be getting worried that I might have a thing going for him at this rate!). Yes I do allow my kids popcorn on occasion as long as it is homemade from non GMO organic corn (got to avoid all that glyphosphate from the Roundup-ready corn.). This is a stage 2 reintroduction due to the presence of the seeds. When reintroducing foods on the AIP, I recommend this guide. First up, you need to dry out all your non-dried ingredients (in the list above, this would include the kale, lemon and orange zest and garlic. I just put them in my food dehydrator until the kale was crispy, but you could also use your oven, set at it’s lowest temperature. Watch the kale like a hawk if you are using the oven – it goes from crisp to burned in minutes. After this, you are going to throw everything in to the food processor and pulse until chopped and evenly mixed. Then put it in a jar for storage…..
Lots of ingredients and it takes time to make, but it is worth it believe me! Store it in a sealed jar in a cool dark place… the pantry is ideal. This entry was posted in Recipes, Stage 2 Reintroduction. Bookmark the permalink.